Being a writer, I create characters, some of which take on a life of their own. One of those is my Pirate self, One-Eyed Red. She is a ship’s cook and doctor on board the pirate ship Calabar Felonway on the seas of Lemuria. Lemuria is part of an amazing Creatives Site that has a worldwide membership and readership, called Soul Food Cafe ( Pythian Games, soulfoodcafe : Soul Food Cafe, Pythian Games, Priscilla’s World Tour ,The Calabar – Pirate Ship ) any of these should guide you to the alluvial flats of Soul Food Cafe, where you can meet writers, artists, artisans of all types, and many other creative folks as well as see what they create. One-Eyed Red is a Pirate’s Pirate, her face is always red, from both the wind and the heat of her belowdecks cookstove. It is her duty to care for the Pirate Crew’s bellies and health: a job she takes seriously and does as best she can. You can count on her for a pipe and a chat whether you’re above or belowdecks, she will be utterly honest, yet she displays kindness on a daily basis. “Now then, is yon ladie finished singing praises like one o’ them wee yellow canaries?” Red fills her pipe deftly, and lights it with a long sliver of wood, alight from the stove’s flames. “She is like that, she is, allus ready t’ see th’ good in other, and share the good wi’ anyone that’ll listen to her.” She pulls in a few fagrant puffs and lifts her feet to rest on a small keg. “I canna complain, she did gi’ me a voice, and a life. And she is a right good un’, fer a landlubber.” Red winks around the smoke from her pipe. The heat and steam in her kitchem have her hair escaping from its’ tight braid in a corona of ringlets around her solemn, chunky face. She flips up the patch on her left eye and rubs the eye underneath before fanning it for a monment, the skin beneath a startkling white in contrast to her sun and wind-burned face. “Noo, I asked her tae let me tell ye good folks what I am grateful for in me Pirate life. Fairst, I am grateful for the faith that keeps me strong an. happy. 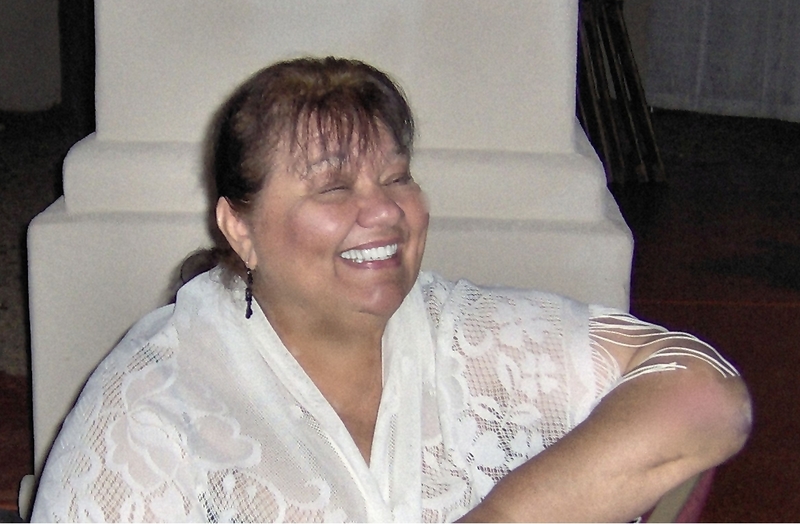 I am exceeding grateful for me Mum an’ Da for bringin’ me intae the world, an’ welcoming me as well. I am thankful every day for bein given the freedom tae be who I is, nae what others would want me tae be. I love music and thank the Gods every day fer th’ joy of it. I am grateful that I am still able to sail on the Calabar, an’ do me job well. I am humbled an’ exalted that I am gifted wi’ the friends I am blessed with. The Sun, Moon, an’ stars that guide me across the sweet waters of the Lemurian seas. Th’ seasons an’ elements, for their gift of life an’ kmowing that everythin’ that hae been, will be again. Laughter, for ’twill chase away almost any megrim what might be weighing yer spirit doon. Red leans forward and tamps her pipe into the cookstove and stands, immediately matching the rhythm of the waves against the hull. “Noo laddies, I must be gettin back to feedin’ amd carin’ for ye, an’ I would be lyin’ if I didnae say that I get such joy frae havin’ all o’ ye in me life.” She turns to the stove, stirs a couple kettles and hums off-key and tempo. And that is what One-Eyed Red is grateful for!! 7. My ability to grow wiser, financially, spiritually. 9. The chance to be a blessing to others. 10. The change of the seasons. To have a life of my own once again. To be in the country and enjoy nature all around me. Gladness to be able to smile and also to shed tears for friends, family and my own sorrows at times. Glad for all the wonderful people I have met in my life, each one has given me the best gift of all, a place in my heart. and each and everyone of you! opps that`s eleven! If any of my reraders would like to add their 10 Things I am grateful for list, you can post it as a comment here, or send it to me in an e-mail at Ooodolezs@aol.com, mark the e-mal re: 10 Things so I know it isn’t spam. My friend Shiloh threw a blog party to celebrate gratitude, and I am still thinking about gratitude. I asked friends to tell me what they’re grateful for, as well as asking my Mum. Since Mum is here with me she wrote her list on a piece of paper. 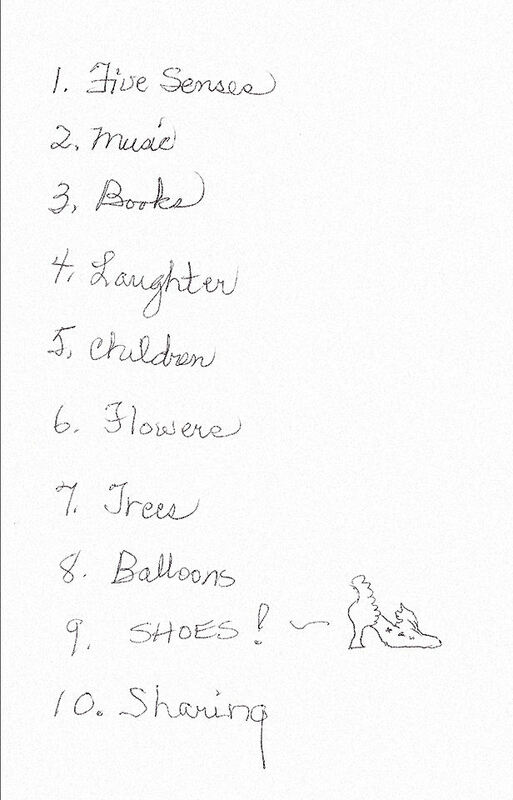 The list so charmed and delighted me that I had to scan it and post her list as she wrote it. I know it sounds rather silly, but Mum is in pain so much of the time that she is sadly cranky, her list was 100% ‘Our Bomba’. I was so soked to see that Bomba that I wanted to show her off, as well as the darling drawing she put on her list. I’ve always envied Mum her ability to do those quick sketches that remind me of a DaVinci study. A word of warning to those who read this: I am crazy, my friend Shiloh will attest to this. I was debating on whether to say anything about this or not. The crux of the matter is this-I feel that I must say something about it. I have long been a student of both world mythology, and comparative faiths. Putting aside labels and preconceptions allows anyone to see what I have seen. The truth is so simple that we often overlook it, and resort to labels and stereotypes for the sake of comfort. Setting them aside is a sobering and uplifting experience, to realise that all ‘real’ faiths are rooted deeply into the same spiritual soil. We all (seperate faiths) believe in a Creative Power higher than ourselves, and that Power bases our ideals in the most powerful, transformative emotion we express. I understand if the old labels and stereotypes stand in your way for a time, that is human nature; to remain within a comfort zone, as it were. Those of us that are close enough to our personal Deity (ies), in an everyday, practical manner will see the logic and truth in what I am saying. Different styles of worshipping are much like the different flavours (races) are simply a matter of geography. If some of you are upset by this and stop reading, I understand and hold no hard feelings for any of you. For those that do continue on this journey, welcome, and love overflowing to you. Now, I’m sure a great deal of you reading know of the Harmonic Convergence expected on 20, December 2012. So many people are calling the End Times, and the End of the World. I cannot agree with that. Simply read the Biblical passage, to paraphrase, “And there was a New Heaven and Earth, for the Old Heaven and Earth had passed away.”. That does not sound like the End of Everything, more like a rebirth on all levels. Rebirth, it means- to be reborn after a death, whether real or symbolic. In the Christian faiths one is considered to be reborn through commitment to the laws of God. In Wicca it is the rebirth of fertility and life at the Vernal Equinox. On any road, faith rooted in love celebrates and thanks the Deity (ies) for Their Love and Generosity. About a year ago a special friend of mine taught me how to ‘read’ crystals. I found and purchased a pair of lovely quartz crystals before that, and I have been slowly reading them. Being a learning junkie, I read all sorts of informational texts, as well as being addicted to NatGeoTV, History Channel, and so forth. I watched the show that NatGeoTV did on the giant crystal cave that was found in Mexico. That was not too long after I began dreaming in another language, not one of romance languages mind you. That would not have surprised me; I have learned some French, Spanish, Italian, German, Russian, Hungarian, and Romany. I didn’t recognise the language I was dreaming in, but I understood it. My dear friend, Shiloh, turned me on to a Foreign Language Dictionary site. I downloaded languages I understood, and then branched out, getting dictionaries in Tibetan, and Sanskrit as well as Old English and Old Norse. One day, for giggles and grins, I decided to wander through the dictionaries to see if I could find anything that was similar to the language I was dreaming in. After a few tries that came up with nothing, I peeked into the Sanskrit-English Dictionary, and there were the words that I still remembered months later. Not only did I recognise them in print, they were applicable to the other specifics of the dream. That was weird enough for me to pay closer attention to the things that were cropping up in my everyday life. These little things began to add up (to me anywhooodlz) to a big something. As I am writing this I intuit that (after another reading of my biggest crystal) we, all of mankind are supposed to celebrate the Harmonic Convergence with worldwide prayers of Celebration and Thanksgiving, each in the manner of our own faith, during the time of the exact convergence. I further feel that this unified front of faith is what is needed to usher in the ‘New Heaven and Earth”. For those that are interested, the exact phrase that I hear is “Raghuttama raNa” pronounced- ‘Ray whoo tama rah-ah nay’. The phrase refers to (to the best of my knowledge) honouring the two 2 greatest warriors of the Raghu race. I intuit that this is the phrase that the Keepers of the ‘Key Crystals’ are supposed to sing as a round or chant, a capella. As each voice group finishes the phrase they start again. My instincts tell me that this will create a resonance between the Key Crystals, and the Cave of Giant Crystals. On a quick side note, the Cave of Giant Crystals began to grow about the same time as the last Harmonic Convergence, some 5.000 years ago. In the meantime, all of us can spread words of love and cooperation through our words and actions. Celebrate and be Thankful that we are the ones to usher in the next Age of Mankind. I do not claim to know everything, and so I welcome anything that you, patient reader, may have to share on this subject. Namaste, God Bless, So Mote It Be, Shalom, Salaam. Let us sing the praises of our Deity (ies), and speak Gratitude for their Love and Generosity.